Welcome to the world of rapid, efficient text recognition and reading with KNFB Reader for Windows 10. This guide will help you learn to use the KNFB Reader app on your Windows 10 mobile device or PC. 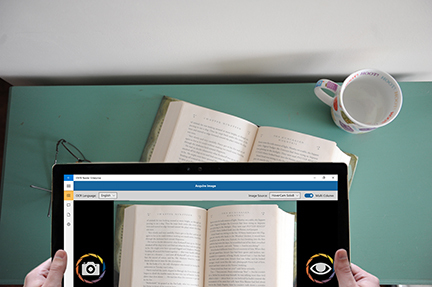 KNFB Reader will enable you to read most printed documents just seconds after taking a picture. KNFB Reader has been developed to recognize and process a wide variety of type styles, printing formats, and lighting conditions. However, as computer software, the app is not quite as adaptable as the human brain. You can expect some printed matter to be read accurately with very high reliability, but in other instances performance with a particular type of print or item may not meet your needs. In general you should give KNFB Reader a try with things you need to read. This will help you to learn best what to expect. KNFB Reader is not designed for use with handwriting or scrolling text on a screen or sign. Accuracy for household product containers (food boxes, tea bags, milk containers, detergent bottles, etc.) may vary, especially if the written information on these containers is artistically presented or is surrounded by pictures and graphics. Except for obstructed images, the app can generally adjust to a normal amount of variability with each of these factors. Nonetheless, some attention should be given to minimize the impact of any of these variables when getting ready to take a picture. When KNFB Reader first starts up, you will be on the “Acquire Image” screen with focus on the “Take Picture” button. KNFB Reader will detect all cameras and scanners currently connected to your device. If multiple image sources—cameras and/or scanners—are connected to your device, be sure to select the one you want from the Image Source combo box on this screen. This page will be described in detail later in this manual. Place your document under the camera. Most cameras should be at a height of approximately 10 to 13 inches or 27 to 32 cm. Check your camera periodically to make sure that the lens is clean and unobstructed. Be sure that no portion of a finger or your hand is close enough to the camera to block the view of the document. To take a picture, navigate to the “Take Picture” button and press the Space or Enter key. You can also take a picture from anywhere on the Acquire Image screen by using the shortcut combination of Ctrl+T. Place your document in the scanner bed. Squaring the edges of the document with the borders of the device will improve page alignment. To take a picture, navigate to the “Scan Image” button and press the Space or Enter key. You can also scan an image by using the Ctrl+T shortcut key combination from anywhere on the Acquire Image screen. The image is then processed for text. If any is found, the text is displayed automatically and read aloud as the Reader screen opens. To pause or resume reading, activate the “Play/Pause” button, which is located near the bottom center of the screen or use the shortcut combination of Ctrl+P. To navigate through the text, Tab or Shift+Tab to the text display area of the screen and use your screen reader’s standard document review commands, or you can also use the navigation controls located at the bottom of the screen. To save the document, activate the “Save As” button located at the top of the screen just above the displayed text area or press Ctrl+S as a keyboard shortcut. The file name defaults to the current date and time, or you can press Backspace to delete the default, then enter the file name you want, Tab to “OK,” and press enter. To return to the Acquire Image screen and take another picture, use the Ctrl+M keyboard shortcut to activate the main menu or press Backspace to go back, or you can select it from the Main Menu in the upper left-hand corner of the screen. Sharp pictures are essential for optimal performance. Be sure to adjust your camera to a height which captures all of the text. For best results, place the text you want to read on a flat surface centered under your document camera. Flatten the document as much as possible. Fill the screen with the view of the document you want to capture. To confirm your camera position or learn the feel of a well aligned picture, use the “Field of View Report” option. You can obtain a Field of View Report by pressing enter on the “Field of View” button on the Acquire Image screen. You can then adjust the position of the page and repeat the process as needed. The goal is to have the camera close to the document but still far enough away so all four edges of the document are in the field of view. Practice will help in the beginning. Use a familiar document printed in clear type on an 8.5 by 11 inch (letter format) or 21 by 29.7 cm (A4 format) white sheet of paper for your initial practice sessions. Place the document on a flat surface having a plain dark matte (not shiny) finish. After some practice with positioning and taking pictures, you will begin to know how KNFB Reader responds. You will also be better prepared to analyze and correct conditions you can control when performance does not measure up. A little practice and persistence can greatly improve performance. This guide describes navigation of KNFB Reader on your PC. If your device has a touch screen, all controls will respond via the standard Windows 10 touch screen gestures. The standard mouse and keyboard commands can also be used. For instance, Tab, Shift+Tab, the arrow keys, and Space or Enter should serve when navigating or activating any controls. Additionally, shortcut keys have been assigned to most functions. A full list of shortcut commands has been provided at the end of this document in Appendix A, while commonly-used commands are noted in relevant sections. KNFB Reader is designed with the needs of users of screen access software in mind. Most major screen readers will be fully compatible. Currently, Narrator, NVDA, and JAWS for Windows are known to work quite well. As a result of an app built using the Universal Windows Platform (UWP) KNFB Reader is fully compatible with phones and other mobile devices running Windows 10. The Narrator screen access solution included in Windows 10 makes non-visual access to KNFB Reader possible. A short, fast motion with one finger anywhere on the screen to the left or right will move to the previous or next element. A short fast motion with one finger anywhere on the screen up or down will change the granularity of the navigation element. For example, flicking down would change from “Character” to “Word.” Swiping to the right would then advance to the next word. Activate the currently selected item by double-tapping anywhere on the screen with one finger. Touch the screen and slide your finger to navigate spatially. Go back by selecting the “Back” button—typically located in the bottom left corner of the screen. KNFB Reader is designed with your productivity and ease-of-use in mind. The minimum number of controls and settings are presented on each screen in order to improve usability. Following is a detailed description of each of the app’s screens with an explanation of each control in tab order. This is typically left to right and top to bottom. The Main Menu appears near the top-left corner of every screen of KNFB Reader. It opens to Acquire Image, Reader, File Explorer, and Settings when activated by pressing enter when you hear “Main Menu” or by pressing the Ctrl+M keyboard shortcut. This is the primary means of switching among the four major screens of the app. KNFB Reader opens to the “Acquire Image” screen. The other screens are used for reading text and performing other functions in the app. Think of the Acquire Image screen as the home screen for the app. The next few sections will discuss using the controls on the Acquire Image screen in greater detail. Focus is forced to the “Take Picture” or “Scan Image” button when moving to this screen. As this is the most commonly used function of this screen, the conventional reading order is overridden. The name of this control changes from “Take Picture to “Scan Image” depending on whether you are using a camera or connected scanner. Nonetheless, it immediately captures an image. The workflow then changes depending on the “Process Multi-page Document” control discussed subsequently. Unless you toggle this control to “On,” the default is “Off,” so the captured image is processed and the results are presented on the Reader Screen. The number of recognition languages available will vary based upon your installation of Windows. At the time of initial release only English is available. This will change shortly, as rapid updates are planned. When toggled “On,” recognized text is processed in columns rather than straight across the page from left to right. Newspapers and magazines are often laid out in columns wherein the text is read from the top of the column to the bottom. The next column to the right is then read. The “Field of View Report” is available to help learn how best to align the camera with the document you want to read. Use the Field of View Report button to capture an image and announce the position of your camera relative to the document. Similar to capturing an image for text reading, the camera should be centered over the print material approximately 10 to 13 inches (letter format) or 27 to 32 cm (A4 format) away in order to have all four edges visible in the picture. An optimal Field of View Report is, "All four edges are visible, rotated zero degrees clockwise." This means that the entire document is visible in the frame and no text will be cut off. Practicing with the field of view report will help you get a feel for how the camera sees various document sizes and works in different lighting conditions. The “Tilt Guidance” setting is an alignment tool that can be toggled on and off to provide vibration or sound feedback (selected in the “Tilt Settings” section of the “Settings” screen) indicating whether the camera is being held level over a document. When this setting is enabled, your device will vibrate in Image Capture mode when the device is tilted to the left, right, front, or back. The vibration or sound pattern pulsates when the device is not level with a desk or table. Rapid pulsing indicates more tilt right, left, front, or back; and slower pulsing indicates less tilt. No pulsing means the device is level over the document. Some devices may also provide vertical alignment indication when capturing text from computer screens or signs. Note that not all devices offer haptic feedback. The recognition process will then begin. Announcements will be made as images are successfully processed. When recognition is complete, the recognized text is displayed and can be read on the Reader screen. Recognized text is displayed in the “Reader” screen. Reading can be stopped and started. Synchronized highlighting will denote the line and word currently being spoken. Characteristics, such as background and highlighting colors, font style, size of print distance between lines, speech voice, volume, and speed can be modified on the “Settings” screen. When the Reader screen opens and a document is displayed, the focus of your screen reader moves to the first word of the displayed text so you can then navigate through and read displayed text with standard screen reader commands. To read continuously “Play/Pause” can be activated from anywhere within the Reader by using the key combination Ctrl+P. Use this feature if you have a multi-page document and you want all pages to be saved together in a single file. Note that you will be prompted to save the first page of a multi-page document by selecting the file name you want or just accepting the date and time default. Then, after the first page is saved, you will be returned to the Acquire Image screen to take the picture and add the second and subsequent pages by pressing the “Add Page” button on the Reader screen each time. In this way you can continue to add pages to create a single document, but to end the process the entire file must be saved again after you have added the final page. This will display the actual image captured which may help someone with sight to analyze and explain problems in text recognition. Activate this control to reprocess and read the latest image captured in a different recognition language or in the opposite column mode. For example, with column mode on, all of the items on a restaurant receipt might be read from top to bottom, rather than reading the item and the price from left to right. Recognized text is displayed here. Conventional text navigation can be used, such as the arrow keys, Page Up, Page Down, Home, and End. Text can be selected by adding the Shift key to the previously mentioned navigation keys. Text can be copied with Ctrl+C. While this text area is read-only, copied text can be pasted into other programs using the Ctrl+V command. Move to previous page of the document. Move to the previous sentence. Stop or start reading. Use Ctrl+P from anywhere on this screen. Move to the next sentence. Move to next page of the document. Please note: All of the navigation controls will begin reading if the automatic reading option is selected. This option changes the language of the reading voice. This is not to be confused with translation or changing of the recognition language. Shows the current value of the reading speed. This can be adjusted directly. Use of the “Increase Speed,” and “Decrease Speed,” buttons are not required. The “File Explorer” screen is where your saved files are located. Press the Applications Key, typically located two keys to the right of the Space Bar, or use the key combination Shift+F10 to access additional file management-related actions including export options, renaming, and deleting saved documents. Allows browsing of your PC’s file system, including access to files stored in Microsoft OneDrive, DropBox, or other cloud services you may use. Toggle this setting to “On” to apply an action from the context menu to multiple files. Open – Opens the currently selected document. Delete – Deletes the selected document or documents. Rename – Allows renaming of the selected document. Copy – Creates a duplicate document with the word “copy” appended to the end of the file name. Export – Creates a document to store or use outside of KNFB Reader. File Name – This defaults to the name of the currently selected file, but can be changed as desired. File Type – Several document formats are available for export. Select the location for your exported file using the Windows file management controls available in Windows 10. Navigate to the “Settings” screen from the Main Menu. This screen contains groups of settings which are selected from a panel of options. Use the arrow keys to choose an option and press the Enter key to select it and open the selected group of options. The Left Arrow and Right Arrow will access all available choices, while the Up Arrow and Down Arrow will move vertically from row to row. Highlighting – Toggle the highlighting on and off. Highlight Colors – Control color of the currently selected sentence. Double Highlight Colors – The currently selected word can also have a unique color highlighting. Auto-play – When toggled “On,” reading will begin automatically when text has been recognized. These three groups of settings control the speech characteristics for the KNFB Reader internal voice. They will function independently of screen access software settings. Available Resolutions – Generally, the highest resolution available is desirable, but this may negatively impact processing speed on slower devices. Camera Rotation – While KNFB Reader’s recognition is unaffected by page orientation, the appearance of the page in the image view is the result of the document orientation in relation to the camera. Your physical environment may dictate placement of an external camera so that the expected top of the camera view does not align with the top of the document. This rotation option can be used to resolve such a mismatch. An adjustment of 90 degrees is not uncommon. Flash Mode – To take the perfect picture for optimal text results, it is important to have an adequate light source. The Camera Flash control, accessed on mobile devices by swiping right from Settings on the Acquire Image screen, can be cycled between three settings: Automatic, On, and Off, with On set as the default. The Automatic flash setting utilizes the light sensor on the camera to determine whether additional lighting is necessary, and triggers the LED flash when the reading environment is too dark. Cycling between flash modes may provide better text results depending on the material of the document being captured. As an example, there may be instances where disabling the flash may provide better text results from a glossy brochure or computer monitor. Focus Mode – If offered by your camera, this will automatically be set to “Continuous.” Modifications are generally not recommended. Available Scanners – Select the desired device from the list of attached scanners. Brightness – Some scanners offer the ability to control the brightness of the internal lamp. This may have a significant impact on recognition results depending on the individual document. A document which has faded or has poor contrast may be improved with increased lighting, while very thin pages could be washed out by the light shining through them. Contrast – Adjusts the light and dark threshold. Should not be changed for most users. Manually changing these settings may yield improved recognition results, but is generally recommended only for advanced users. The proprietary technology of KNFB Reader expects color images and will likely perform best with this setting under most conditions. Sound – Provides audible tones which increase and decrease in proportion to the degree of deviation from the horizontal or vertical plane. Vibration – Provides haptic pulses which increase and decrease in proportion to the degree of deviation from the horizontal or vertical plane. Save to OneDrive – All documents saved in File Explorer will be saved in a “KNFB” folder in OneDrive as well. Backup KNFB Files to OneDrive – All documents in the File Explorer will be compressed and saved in OneDrive as a file named “backup.zip” in the “KNFB” folder. Restore KNFB Files from OneDrive – Files previously stored in OneDrive using the Backup function will be restored and then appear in the KNFB Reader file explorer. Save to DropBox – All documents saved in File Explorer will be saved in a “KNFB” folder in DropBox as well. Backup KNFB Files to DropBox – All documents in the File Explorer will be compressed and saved in DropBox as a file named “backup.zip” in the “KNFB” folder. Restore KNFB Files From DropBox – Files previously stored in DropBox using the Backup function will be restored and will then appear in the KNFB Reader file explorer. Contains version information and other details. One of the most common uses of KNFB Reader, especially on a desktop, laptop, or notebook computer is recognition of otherwise inaccessible PDF documents. PDF, PNG, and JPG files may be imported in to KNFB Reader for text processing using the “Open With” function. This means that if you have an image-based PDF or JPG file that you know contains text, importing the file in to KNFB Reader will enable you to rapidly process the file, extract any text, and have the contents read aloud and available in Braille as provided by your chosen screen access software. Learning from others is perhaps the best way to master use of KNFB Reader. An email list is maintained by the National Federation of the Blind for this purpose. To subscribe, go to www.nfbnet.org/mailman/listinfo/readerusers_nfbnet.org, or send an email to reader-users-request@nfbnet.org and put the word “Subscribe” in the subject field. If you still have questions after you have studied this guide and consulted the user list, please email a request for assistance to support@knfbreader.com. Generally, any Windows 10 compatible scanner or camera should work, though some drivers may bring up inaccessible windows. This is beyond the control of KNFB Reader. Any device capable of installing and running Windows 10 should be able to accommodate KNFB Reader. Older machines and those with low amounts of available RAM may run more slowly. Decreasing the resolution of images may help, though there is of course a minimum at which text may not be recognized as well. This will vary depending on the particular configuration. It is recommended that your computer be restarted after connecting a camera or scanner. Not doing so may produce unpredictable results within KNFB Reader. Note: Other company names and products are trademarks or registered trademarks of their respective companies. © 2018 KNFB Reader, LLC and Sensotec nv.